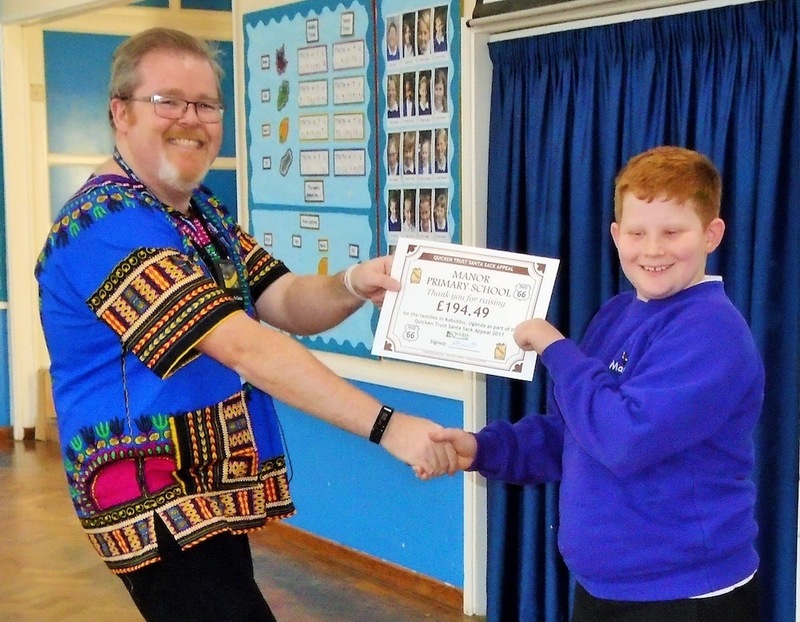 Pete Everett from the Quicken Trust presents a certificate to Nathan of Manor Primary School to mark a donation by children to buy maize for families in Kabubbu in Uganda. Uckfield pupils have made a huge difference to the lives of people living in the Ugandan village of Kabubbu, and particularly of one child and his family, over the years. 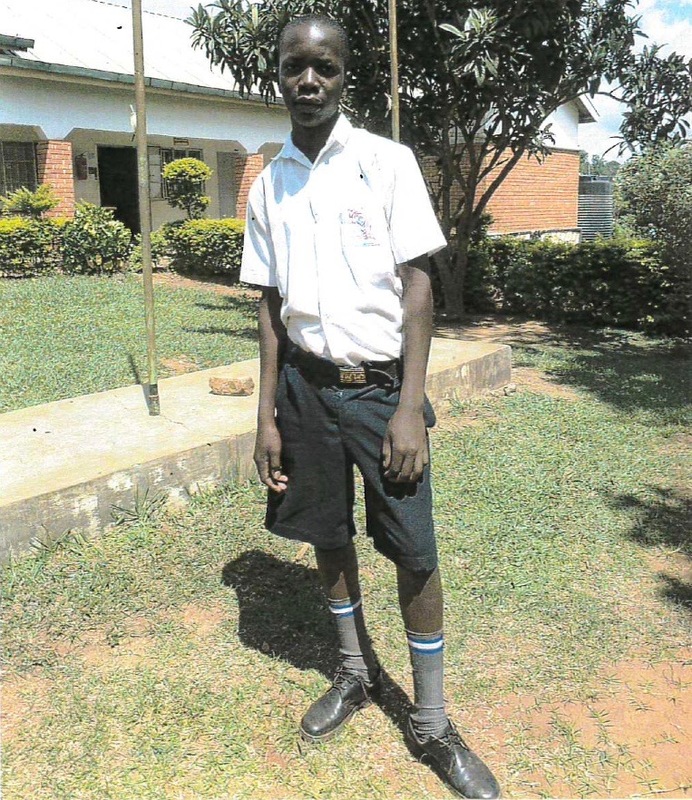 Manor Primary School children began by sponsoring Akamada Bukenya, who is now 15, and as their interest in him grew they launched a fund-raising drive in 2014 to build a new home for his family. The land was bought in spring 2015, the house was built by the summer and the family moved in. Recent pictures show crops growing around it and washing hanging out. 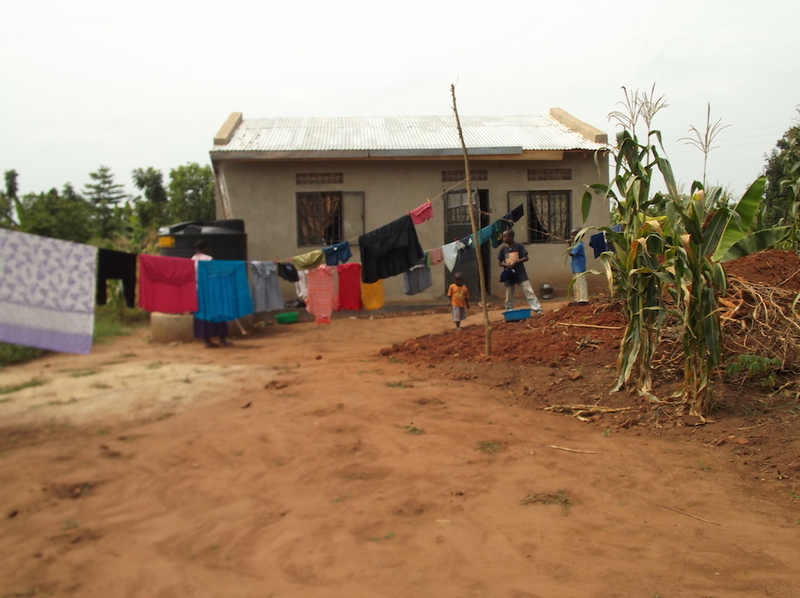 The house built in Kabubbu, Uganda, thanks to the efforts of fund-raisers at Manor Primary School. So much money was raised at the time that Manor was able to secure Akamada’s education over the last three years and enough to pay for at least two years of secondary education. They were thrilled to learn this week that he has successfully passed the exams which will enable him to progress into secondary education. Akamada Bukenya, who is sponsored by children at Manor Primary School. He has passed his exams to start secondary school where his place will be funded by his Uckfield sponsors. Manor business manager Ruth Martin said children in Kabubbu children only start school, if, or when, their parents can afford to send them, or if they have a sponsor. She added: “It doesn’t matter how old a child is, they start in the equivalent of our reception classes and only progress to the next year if they pass the end of year exams. Manor’s relationship with Kabubbo has developed with the help of the Quicken Trust who work tirelessly to support children there. Manor Primary School business manager Ruth Western with Akamada back in 2014 when she went to Kabubbu to tell his family the primary school was raising funds to build them a house. And before Christmas Manor pupils joined forces with the Quicken Trust again by donating pocket money to buy Santa Sacks of Maize for village families who have been hit by drought and rising maize prices. This is partly due to the refugee crisis on Uganda’s northern border with South Sudan. A representative of the Quicken Trust, Pete Everett, came to Uckfield this week to tell Manor children they raised £194.49 through filling Quicken Trust money boxes with loose change and pocket money. This is enough to buy three sacks of maize which will feed three families for about a month. In all, the Quicken Trust Christmas fund-raising was able to buy 331 sacks of maize. Ruth said it was rewarding for all at Manor to see how their fund-raising helped in Kabubbu. She visited Uganda herself in 2014 to tell Akamada’s family that funds were being raised to build them a new home. See How Uckfield schoolchildren change lives of Ugandan family. And since then Manor has received regular news updates from the village. Ruth said that building the house was a huge achievement and the school’s commitment to Akamada and his family continues.